Felix Ramon Guirola, a 51 year old Cuban, born in Ciego de Avila, wants to impose the Guinness record for riding the highest bicycle in the world, next July. For months he has been preparing one of his heavy bikes that can measure 10 to 12 meters high. 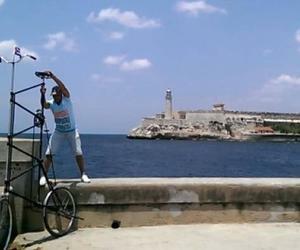 The risky exhibition will take place in front of the Capitol of Havana, just where the zero kilometer of Cuba is. To be recognized as the creator of the highest bicycle in the world, is an effort in which he was involved for 34 years.